Dan : Well, I seem to be addicted to the H942s lately. The first one was about 4 years ago, than I go on a long 3+ year hunt for another one, and three of them fall into my lap. This one I picked up from a feller on this forum. By his descripion and pictures, I knew that at least one brace had become unglued, so I bought it. It got to me very quickly. On immediate assessment of the guitar, one brace was definately loose. I can feel it from the sound hole. 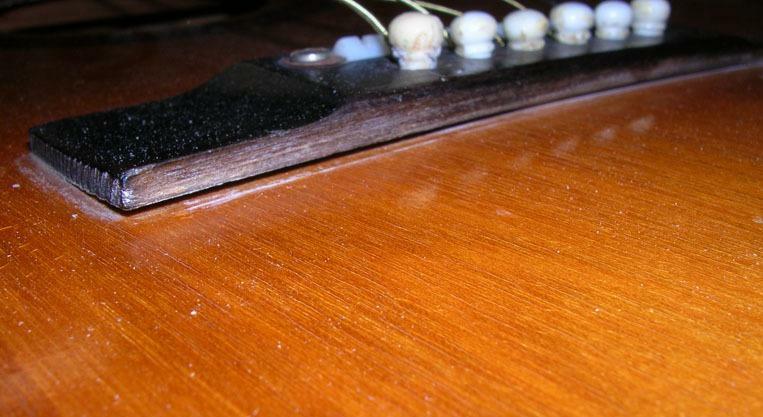 Also, there was a crack by the fret board, and the bridge was starting to lift. Also, the frets were sticking out a little bit. 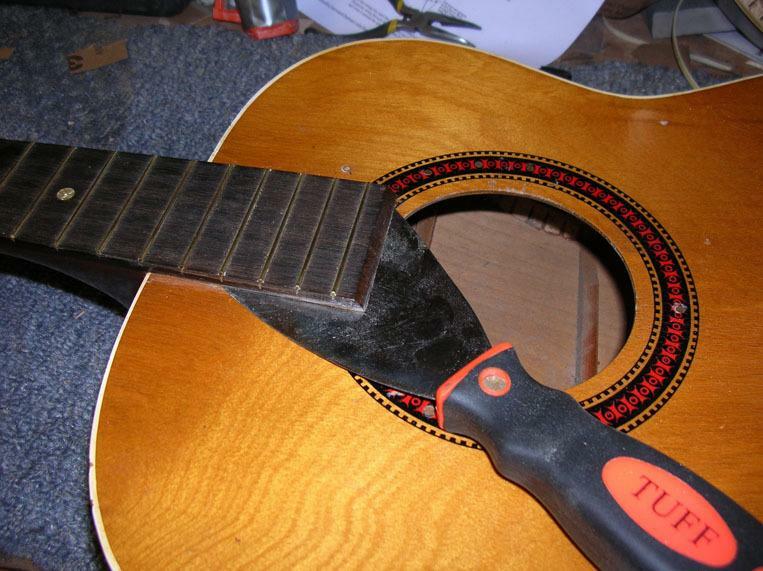 So, basically, this poor guitar was left in the heat long enough to render the glue useless, and to dry it out a bit. 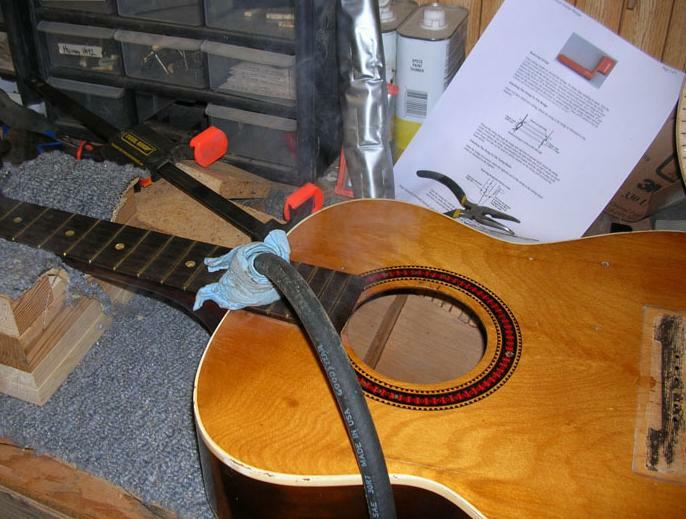 This guitar also needed a new nut, some replacement tuning machines. The ones on this guitar work, but I just don't like the posts (flat, no groove for the strings to collect). I'll be upgrading these to modern tuning machines. 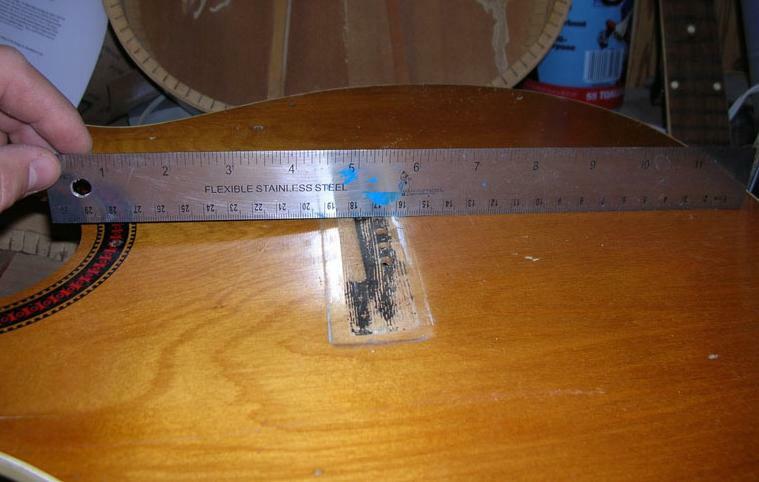 Actually, this guitar was in such heat that the fingerboard extension wasn't even glued down. Here's a spatula I stuck under it without applying any heat, or forcing it under there. I figured that my job was clear. 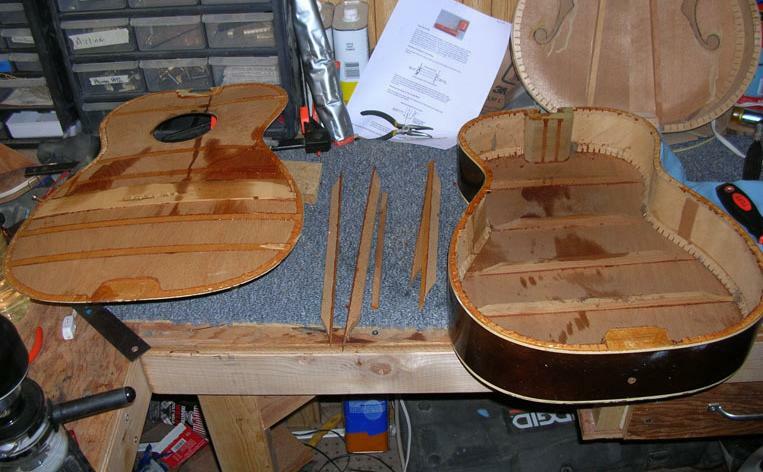 I needed to glue in the one brace that was loose, and re-glue the bridge. 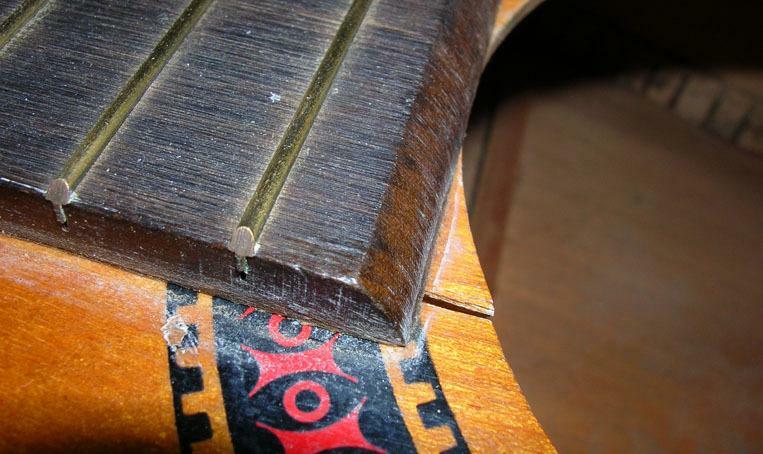 Also, I needed to force glue under the fingerboard. 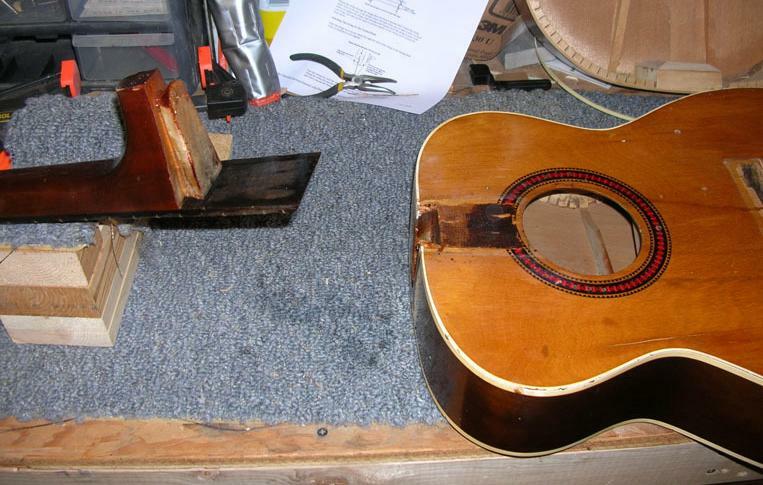 Well, I took the bridge off, and I heard two braces fall inside the guitar. 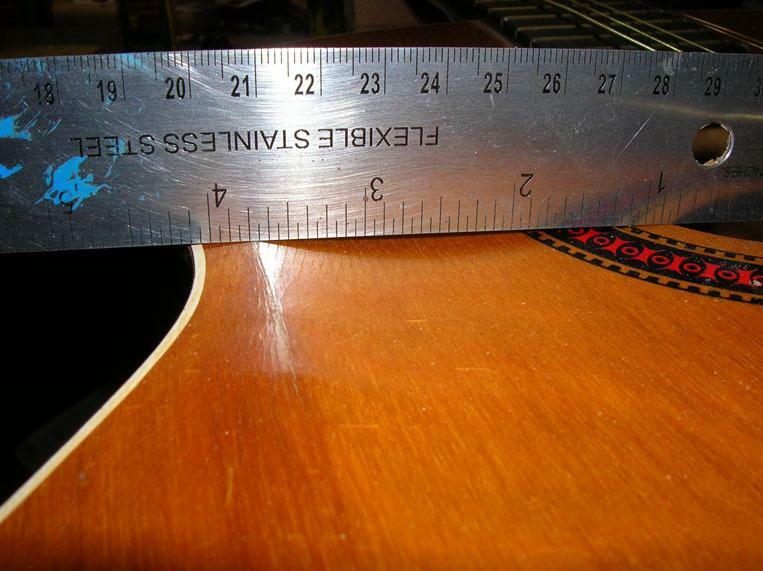 The one near the sound hole, and the one near the bottom of the guitar. Great! Now my job was clear, I need to remove the top. You can see how the top was sunken in with the braces not doing their jobs. 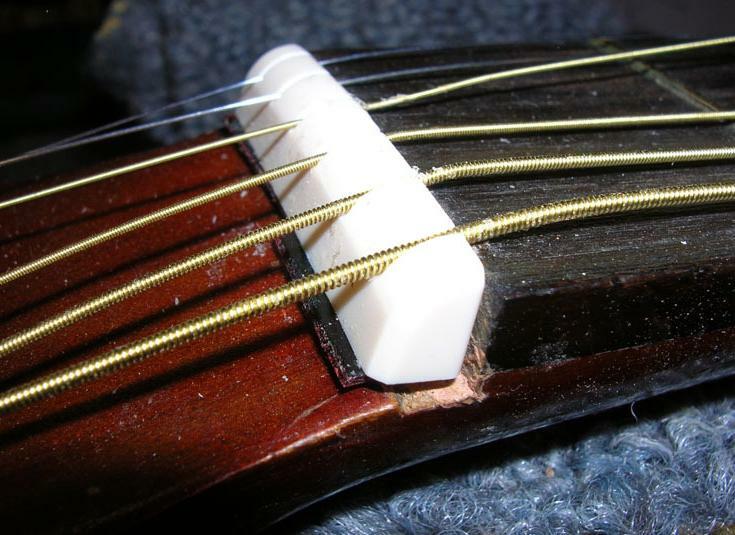 So, out comes the 14th fret, and out comes the steam needle. The neck came off easily, especially since I didn't even need to heat off the fret board. The top came off without an issue. I just slid the spatula inbetween the joint, and the old glue just cracked away with very little effort in some spots, to no effort at all in other spots. Also, as I was removing the top, I could hear the other three braces just fall off. So, with the top off, I could see how bad the top really was. It was sunken in at some spots, and bulged out in others. Just pressing the bulged area near the neck, I could hear and feel the wood wanting to break, so I figured that I had to make the wood pliable. I took some disposable shop rags, and soaked them in water. I also turned on my iron at full heat with full steam. I would work in spots just a minute or two at a time, just until the rag started to dry. I would move the rags around, re wet them, and place the iron on top. I did this for about 20 or so minutes until it was completely pliable. 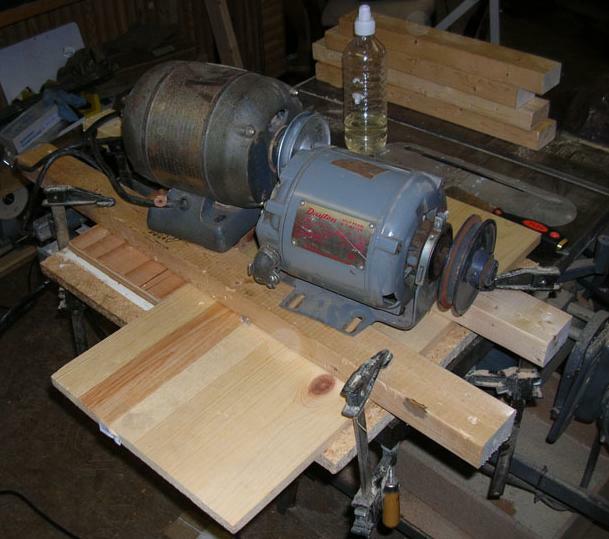 As you can see, I placed the top on some partical board I had laying around and placed them on top of my table saw. My saw is an antique (from 1948) with a really heavy and flat cast iron top, so I knew things would stay straight here. After I got the top pliable, I put a couple pieces of plywood on top, a couple of 2X3s across them, clamped them down, and to add a little more clamping power on it, I placed two heavy electric motors (the kind you would use to run a belt driven power tool) on top in the middle, and there she will sit for at least a week. More to come as I work on this guitar. Thanks for watching ! Snapcase : Thanks for the report. 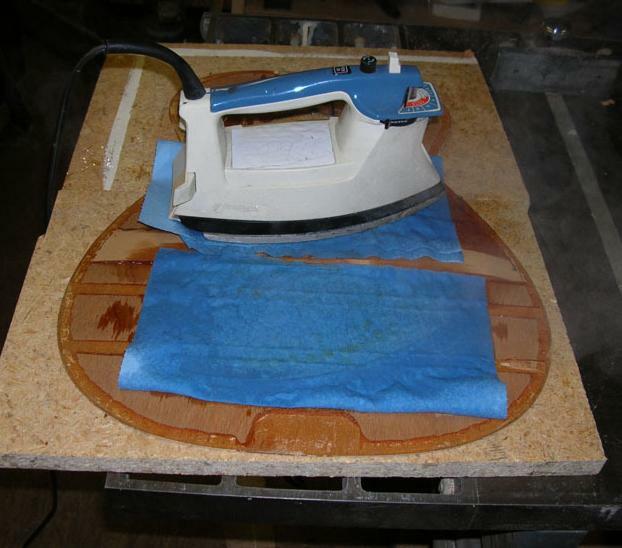 I have to flaten a couple of tops and I wouldn't think of soaking with heat the boards first. Great advise. 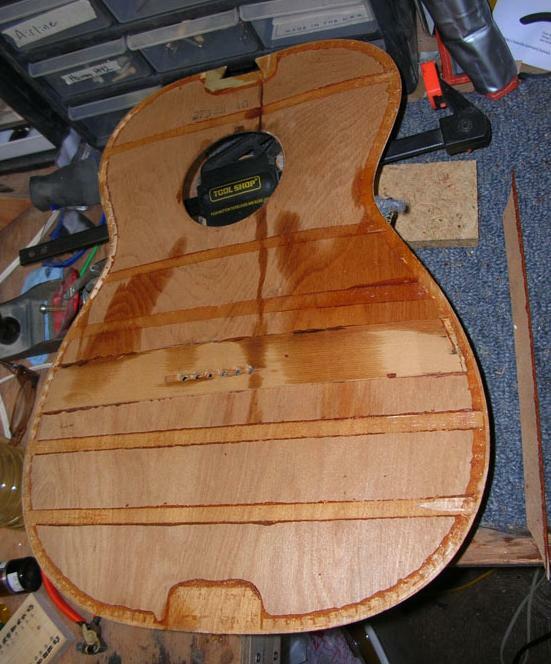 Dan : This is actually my first attempt at doing this to an entire top, but I have done this to a couple of guitars with severe belly bulge, both with solid wood and laminate, and it works surprisingly well. I'll be working on this guitar again this Sunday, so I'll let you all know how the top came out. 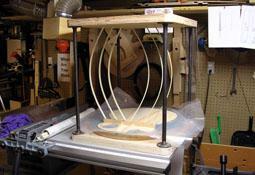 This guy is using fibre glass bars, I've seen them also with maple dowels. Obviously there's a zillion ways to make the cage it just has to be rigid and strong. Those bent bars exert a surprising amount of force. His recommendation of 2' for the height sounds about right. Dan : Actually, I'm way ahead of you on that... Tomorrow is payday, and I will be ordering 24 go-bars, and will be constructing a go-bar deck this weekend. 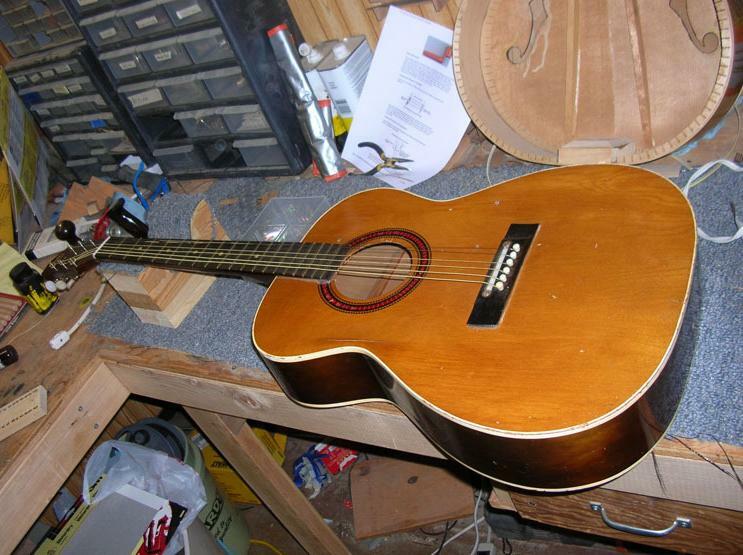 I decided that I need it when I re-glue the braces back onto this guitar, and two others (you can see the archtop in the background of these pictures. It has loose tone bars). I figured that the way I have it in these pictures would keep it flat on 100% of the area. I suppose go-bars with the wood on top of the top would work too, but this way ought to do just as well. Thanks for the input though.